Yes, during my first long run after Oil Creek while running in Umstead with 3 of the Angels, Amy, Jenn and Karla I passed my 40,000 lifetime mile. Seems like a pretty big number but I have been at it for 35 years now. Funny thing is that over half of those have come in the past 10 years. 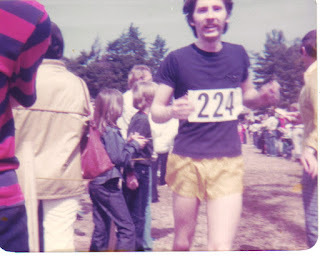 During my first decade of running I only hit 1,000 for a year on a few occasions and my best was about 1600 in the early 80's. The miles really dropped off in the 90's and it wasn't until after the knee injury from soccer in 1998 that I re-dedicated my self to running. From then until 2002 I was still fairly low mileage, about 20 a week and concentrating on triathlon but after jumping in on my first ultra on a whim, things begin to get serious . The really cool and amazing thing now is that I am not only running more but enjoying it more than ever, especially having the privilege of sharing a lot of the miles the past 7 years with the most wonderful training partners that I call my Angels and Princess. The picture above was taken finishing my first 10k at The Natural Run in Winston-Salem in March 1978 in 48:59. If you look closely at my left hand I have just grabbed my finishing place popsicle stick from the man on my left. After that day I was hooked for life.